Beer Fellows: Beer links for the week of May 21st! Big week this week so let's dive in! So many awesome options on this list though I think a stop at Kalamazoo is in order the next time I head to Wisconsin. 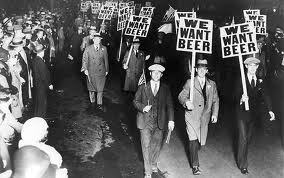 I do like these old repeal Prohibition stories, but beer drinkers, let this serve as a reminder to never happen again! Preakness always makes me think of this. If I was a cop this is where I would camp out after midnight and watch bad decisions live. Missing out on Funky Buddha is my biggest regret from this year's Brewvival. For our friends in Goodhead Brewery! If you folks get up that way let us know your thoughts! Someday I am going to drink beer in India and it is going to rock. Remember beer is subjective, but it's sure fun to argue about. On a more interesting note I would like to know the impact of personal beer reviews on purchasing. I admit that I use them. Fun little video...though the goat produced mead, not beer, both tasty though. Good public relations strategy here...hey if you are reading this and you haven't started following the JGF fan page then click here! I'm so confused, but I'd be willing to try it! As mentioned above it is a big week. On Wednesday I'll be in New York City at the New York Historical Society press preview for their Beer Here exhibition. Look for a sneak peak later this week. We also will be reviewing imperial pilsners and if I am lucky sitting down with a brewer from NYC. So stay tuned!